Discussions of wealth inequality are oftentimes muddled by insufficient statistics. You get some stray comparisons of medians or comparisons of the wealthiest 400 families to the least wealthy half of the country. These incomplete pictures lead to mind-numbing debates about class and race that go nowhere. Below I try to clear up these debates with a more complete picture of race, class, and wealth in America. When we just look at how much wealth each group has overall, we see whites have far more wealth than blacks and Latinos. They also have more than the residual “other” category, which includes Asians, Native Americans, and anyone else that does not fit into the other three categories. 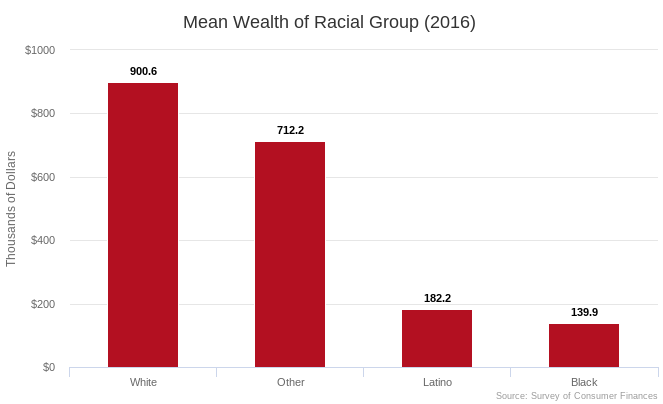 This gives the best picture of the overall racial wealth disparity, but such aggregates obscure what is going on within each race. Remarkably, despite their very different overall levels of wealth, each racial group has basically the same level of intrarace inequality. For each race, the top 10 percent owns about 75 percent of the group’s wealth while the bottom half owns virtually none of it. In between, there is a modest “middle class” that owns the remaining 25 percent. As I have argued before, I think these graphs tell you all you need to know about the fact that capitalism inherently tends towards a small upper class owning everything. Of course, breaking down each group by itself does not clue you in on where the members of the various racial groups fall along the overall wealth distribution. To see that, we need to show the racial composition of all parts of the distribution. 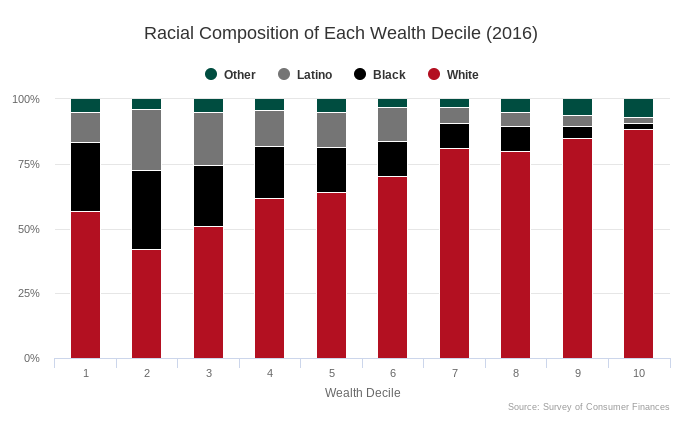 The following graph shows the racial composition of each wealth decile. The first bar is the least wealthy 10 percent of society and it shows that about 56.6 percent of this group are white; 26.9 percent are black; 11.4 percent are Latino; and 5.1 percent are other. The last bar is the wealthiest 10 percent of society and it shows that about 88.5 percent of this group are white; 2.2 percent are black; 2.4 percent are Latino; and 6.9 percent are other. The bars in the middle each represent 10 percent of the population and show a clear trend: the racial composition gets whiter the higher up the wealth distribution you go. What you see in this breakdown is that the United States is dominated by an overwhelmingly white upper class: 88.5 percent of the top 10 percent of Americans are white and that decile owns over 77 percent of all the wealth. The propertyless lower class, defined as the bottom half of the country, is disproportionately nonwhite but is nonetheless thoroughly multi-racial with whites making up the slight majority (55 percent). For all the quibbling people like to do about the relative importance of race and class in American life, the best way forward as a policy matter seems pretty obvious: redistribute from the white upper class to the multi-racial lower class. This kills two birds with one stone as it shrinks class and racial disparity at the same time. According to these figures, every 1 dollar redistributed from the top 10 percent to the bottom 50 percent closes the class wealth gap by $2 while simultaneously closing the white-nonwhite wealth gap by 67 cents.